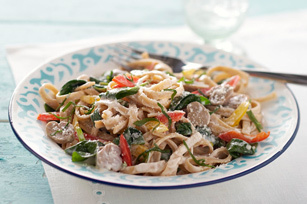 PHILLY Cream Cheese makes the tasty cream sauce for this delicious pasta dish. Cook pasta in large saucepan as directed on package, omitting salt and adding spinach, peppers and mushrooms to saucepan for the last 3 min. Meanwhile, cook cream cheese product and milk in same saucepan on low heat until cream cheese is completely melted and sauce is well blended, stirring frequently. Drain pasta; place in large bowl. Add cream cheese sauce; toss to coat. Top with basil and grated cheese. Substitute 2 tsp. dried basil leaves for the fresh basil and/or fettuccine for the linguine. Feel good about serving this flavourful dish that's packed with nutritious ingredients, such as spinach, a good source of vitamin A, and red peppers, an excellent source of vitamin C.